Why So Many Dead Bodies? I’ve been sick for a few days with a nasty head cold. Sitting in bed with the dogs and my iPad for company, I’ve been thinking about a question readers sometimes ask me: why do so many people die in your books? In truth, not that many people die in my books, but there are definitely a few, and I suppose for romance the number is a bit surprising. The reasons for their deaths are twofold: 1. death can be a useful literary device; and 2. people died in Victorian times. A lot of people. Although the mortality rate fell during the course of the Victorian era (deaths per 1,000 people per year in England and Wales fell from 21.9 from 1848–54 to 17 in 1901, compared to just over 9 in 2015), sickness and death were regular visitors to Victorian communities, and overall, mortality rates were higher for women than men. The most common cause of death: tuberculosis, also known as consumption, which caused about 25% of all deaths during this time period. Other common diseases were cholera, influenza, smallpox, typhus, typhoid (the disease thought to have killed Prince Albert), scarlet fever, and syphilis. In 1858, raw sewage flowed in the Thames, the smell so intolerable it was feared the stench alone would kill Members of Parliament working in their chambers alongside the river. 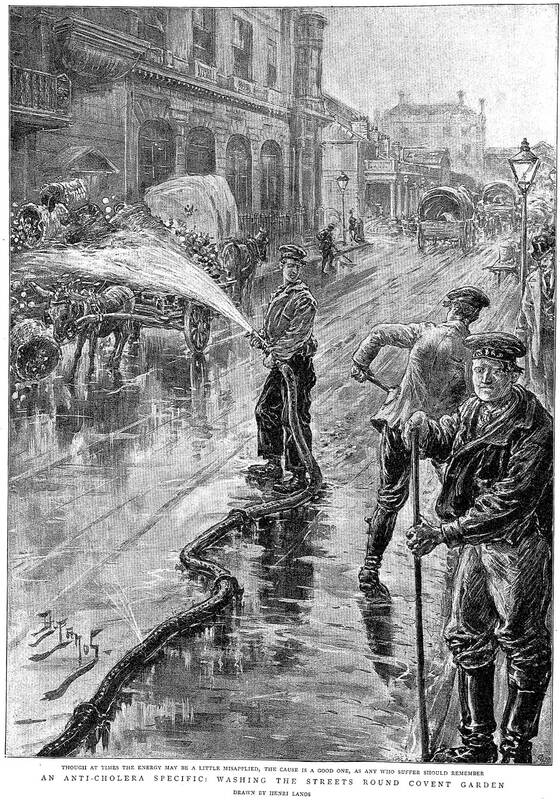 London and other cities, largely because of these conditions, were far less healthful than the country, and the poor were impacted in greater numbers than the middle and upper classes. Although vaccination for smallpox became available in the 18th century, there were few treatments available for any of these diseases until the discovery and widespread use of antibiotics in the 20th century. Cholera, a waterborne disease, killed over 53,000 in 1849. Scarlet fever killed more than 20,000 in 1840. Those who sickened but did not die in a given outbreak were left weakened and susceptible to being carried off by the next illness, which often occurred at nearly the same time as the first outbreak. It is hard now to comprehend the rates at which people died in the Victorian era. My cold is making me miserable but it’s unlikely to carry me off, and even if I do get very sick, two of the best hospitals in the country are less than five miles away. The average Victorian, no matter what class, could not say the same. I’ve touched on the Victorian obsession with death in a previous post, and when you see the high mortality rates of the period, it’s slightly more understandable. Although I don’t think anything really justifies creepy post-mortem photography. Nice way to put a spin on the fact you feel like death warmed over, Marin! Fascinating post, Marin. We are so lucky today. My mother and father had TB, but both survived thanks to modern medicine. I’, sorry you’re ill. Hopefully, you’ll feel better soon. Thanks, CB! It’s amazing how much easier it is to treat TB than it used to be, and I’m very glad your parents recovered! Fascinating post, Marin. I recently researched the illnesses and death rates/causes of the Victorian era and came to much the same conclusion as you. American cities were no better. Your best hope was to live out in the country and pray the worst contagions stayed away, but that often wasn’t the case. Sadly.